The San Rafael Swell is a wonderland of slot canyons, crazy rock outcroppings, and plenty of adventure. Make sure the car has plenty of gas and stop by the Melon Vine Food Store on Broadway to grab snacks and lunch for your day out (there’s no food available where you’ll be going). Get on the interstate and head west. Admire the magnificent, otherworldly rock formations of the San Rafael Swell as you take Highway 24 south for some excellent canyon exploration. If you’re looking for a true canyoneering experience, get in touch with Get in the Wild Adventures who host technical canyoneering trips in Goblin Valley’s Chamber of the Basilisk and Robbers Roost. 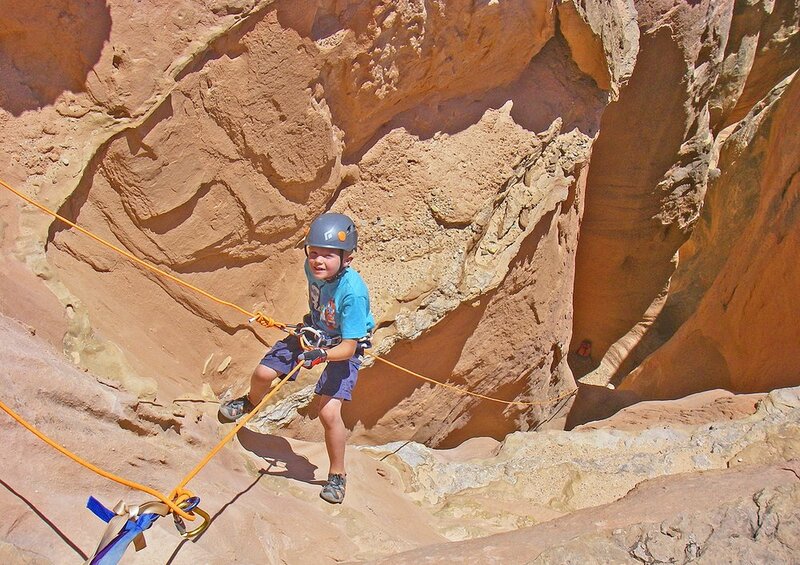 Learn how to rappel and access otherwise forbidden canyon treasures. For a short, easy hike (3 miles roundtrip) over slickrock, the Eye of Sinbad offers a unique and surprising destination—a hollowed slickrock chamber complete with natural oculus that frames the sky above. After turning on to Goblin Valley Road from Temple Mountain Road, look for a dirt road heading west after about 0.3 miles. Drive down this road 0.25 miles to a dirt parking area and follow the trail to the slickrock. You can see the cave to the west from the parking area. Laze about on the sand or finish your day with a campfire and spectacular sunset at Swasey’s Beach. North of Green River, this white sand beach shaded by cottonwood trees spans a bend in the river along the edge of the Book Cliffs. Shallow water gives children plenty of opportunity to frolic, and bighorn sheep frequent the water’s edge. From Skyfall, head east on Main Street, then turn left on Hastings Road and follow it all the way to the beach parking area. The brilliant Red Rock Country between Green River and Moab exemplifies the power of water on this high desert landscape: whittled arches, carved canyons, high bluffs, and large expanses of slickrock reveal the work of water and erosion and provide some of the most breathtaking views and adventures in the entire world. World-famous Arches and Canyonlands National Parks wait to be explored, the Colorado River remains to be rafted, and many hills, gullies, and terraces await your mountain bike. There's so much to do, so plan your time wisely. We recommend packing your lunch and eating at one of the great viewpoints in Arches National Park. Arches boasts some of the most unique rock formations in the world. It is, of course, named after the more than 2,000 natural stone arches found throughout the park. The most famous are Delicate Arch (featured on Utah license plates) and Landscape Arch, the longest natural arch in the world. Arches is a relatively small National Park, but there is plenty to see and do. We recommend getting to Arches as early as possible to beat the crowds and the heat. The Delicate Arch hike (3 miles round-trip, 480 feet of elevation gain) is worth the trek to see Utah's most iconic landmark. True adventurers should plan to hike the 7.2 mile loop of Devil's Garden, or seek a permit from the visitor center to explore the Fiery Furnace. Great mountain biking awaits in the red rock landscape between Green River and Moab. Plenty of easy to advanced loop trails can fill up half or all of your day along the Moab Brands or Klondike Bluffs bike trails. Didn't bring a bike? Get in touch with Poison Spider Bicycles in Moab for a rental. One of a handful of cold-water geysers in the entire world, the Crystal Geyser draws sightseers for its vigorous eruptions and for the brilliant orange travertine formations the mineral-rich water creates. This is a great sunset spot.